Mum has been bizzy at day hunting this week, so not getting a huge amount of stuff done outside. But where all of the old icky plants were she is salvaging some of the old lava rocks to use again. Mum takes here big old shovel and scoops up rocks and dirt. The she puts them in this thing. It is a part of an old litter box. The dirt falls through and back on the ground. Starts with another shovel full. Here so can sort of see the openings where the dirt will fall out. Then once the bucket was full mum dumped it in back by the AC unit. This will keep weeds and stuff from growing since the dirt is hidden below. Here is the back, mum laid it on nice and thick. Glimmer reporting. Looks good so far but she needs more rocks to finish the other side and front. She needs to get cracking here! Oh and while we were inspecting, we noticed a big wasp nest up in the tree! you can biggify the picture and the next is where all of the big limbs come together. It isn't attached there, but it looks that way. Mum all the pest control peoples. They will take care of it next visit. Don't see many wasp fly around. Oh, we need at least one flower picture! One of our day lillies! That is it for this week. Love Virginer and Glimmer. No eating the drapes here. But we do like the high up views from our vantage spots. Ducky up on top of the window valence. He likes it up there, but it has to be dusty. Mum doesn't clean up their much. Derby, on top of the big cold box. Snoopervising mum while shes makes good stuff to eat. Now mum doesn't watch much racy cars on the moving picture box. She gets up close and purrsonal at events and tells people where to go. She had to deal with it raining, but got to spend the worst of the rainy part either under cover in a shed or her car. But she is purrpared with rain gear. So, here we start another week. Have a good one gang. We are planning to just take things easy. Mum says no yard work for her this weekend. We suspects there are racy cars in her future! Fine! Go away, just don't forgets to feed us! This is what it looked liked between our yard and next door. Ratty bushes, icky grass, lava rocks covering the ground. Mum has been wanting to get rid of this and just put in plain old grass. Easier to mow than to try to keep the weeds out. So this neighbor is our good elf guy named Chuck. He will offer to help and do stuff, comes over in the winter with his big snow blowy thing. He has taken limbs off of trees and such too. Seems his kid, Nick, who looks just like his Dad has a cat that can get rid of this stuff. A BobCat! Sheesh, look at that cat go! Gulping and grabbing all of the plants, big bites by big bites and putting them on the trailer. It was up close and purrsonal, right up to the fence to the back yard. All gone and mum is working to get the last bits, bobs, rocks and roots out each evening. Then with the neighbors help get some new dirt and work in a swale to carry rain water away from the houses! Wowwza, that is all for us for this week. Hope you all had an easy and wonderful weekend. We did. Mum was around, so we got our loves during the day. Mum did chores, inside and out. Some major stuff outside, but we will let Virginger and Glimmer fill you in on that on Garden Thursday. Me, Derby the Sassycat, king of all I see, sitting on the top of the tower. If I sit here, I am at the height of mum's head! Ducky, pinning her down while she rested from working outside and before she got ready to make dinner. Something delish for all of us! A funky looking eggy plant with streaks in it, not the typical solid aubergine! Yep, I know big words like that! Mum also tried out grilling zoo-key-knee! Everything on the hot grill just starting to cook. Oh that piece of beast grilling, that does look nice. We better get some! All done and on the plate inside, just a purrfect medium rare for all of us. Both of us being nice and waiting for our bits on the windows ledge by the table. Mum won't give us any if we get our paws on the table while she eats. Ducky nomming his piece away too. Mum gives us a decent size piece but not really big. Can I swipe Ducky's second piece? Nope, the runt got to it. But we both got a third piece. Just delish, mum says it was a good meal, although she wasn't that enthused with the zoo-key-kness. We are just hanging out today. Mum has runned off to get the inside of her metal monster all clean. Seems the inside is a bit of a salt mine from all of the ick of the winter. Sheesh! What has taken her so long to get this done. Otherwise we are just going to take it easy. Nap and otherwise, just chill out! First, here is the silly bird house that mum bought that looks like a cat's head. See the sticks inside? Yep, someone is calling this home. Last evening while mum mowed the lawn and walked by, a little fevver flew out. Mum thought it was some kind of finch. No cheeping babies yet. Our roses bloomed but the are so heavy they keep falling over! Mum got them to stand up, but then she noticed they were down again. She may need to tie them up to something. Our purrply coneflowers getting ready to bloom in the back yard! Most cats, when they are Out want to be In, and vice versa, and often simultaneously. - Louis J. Camuti, D.V.M. HiYa Ducky here. Hope everyone had a nice weekend. We only get to be "in" cats. Rarely are we allowed out, then only in the PTU to go to the stabby place. 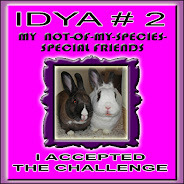 Although, when Miss Lynn dropped by a few weeks ago, mum did get Derby and take him outside to see Miss Lynn. He got all squirmy, so mum brought him back in. She wanted to take me outside, but I refused to let her pick me up! hehehe, so I didn't go outside. We did a lot of this over the weekend. Just chilling on the tower, taking turns as to who had the top spot. Mum did grilled beast both Caturday and Sunday. On Sunday Derby did not come to watch mum eat, but I did. So I got rewarded with a little bit of grill beast, actually two pieces as mum gave me Derby's too! 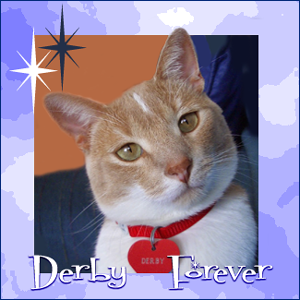 So where was Derby? Sleeping on the tower! You snooze, you lose! Have a grate week everyone. 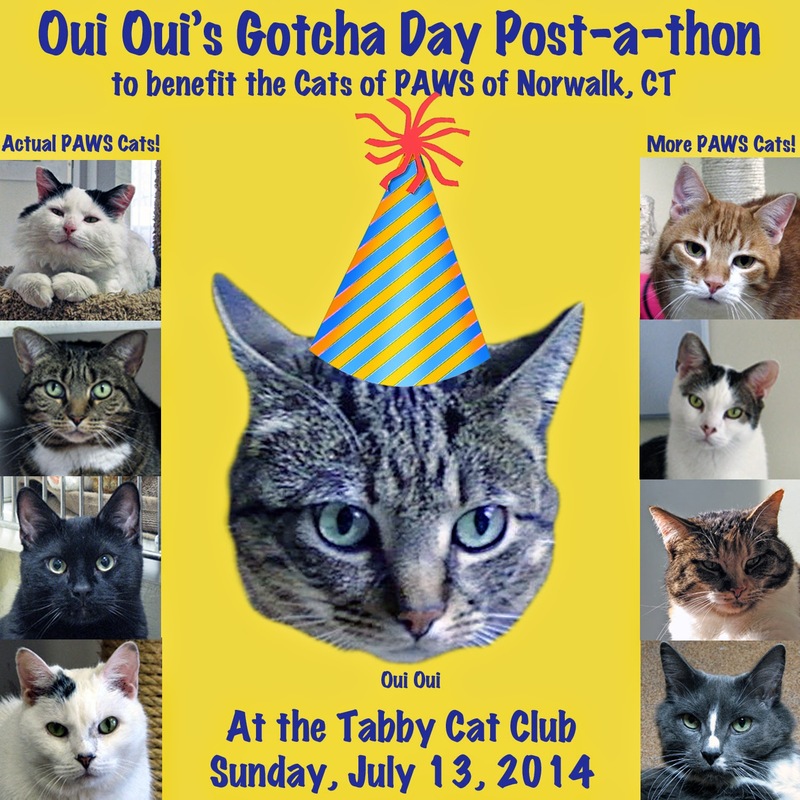 We got our post in at the TCC for OuiOui's Gotcha Day. 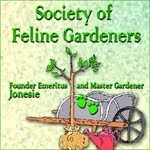 It is a post-a-thon to help get green papers for kitties. What a better way than to spend our day helping other kitties.